This analysis was a request, so if there are any songs you really like that you want featured, leave me a message in the comments. These videos are tons of fun for me to do, and you guys always have great ideas! Before we get talking about the Liebestraume by Liszt, let’s talk about Franz Liszt himself for a moment. I’m going to do a proper history video on him in the future, but when you’re talking about a song, you need to know the context. Liszt was a Hungarian piano rock star. He was, first and foremost, a virtuoso – he was a child prodigy and extremely skilled – and second, he believed in the power of a good performance. He wasn’t the guy who played quietly in the background while people chatted. Liszt would command your attention. He would make you swoon, cry, and gasp with his music. He was a composer of the Romantic era – the same era of Chopin, Mendelssohn, Schumann, and so forth. This era was in the 1800s, and marked a shift from very perfect, precise Classical music to highly emotive, “feeling” music. You definitely get that from Liszt. He can tell a story with his music. And he does with his set of three Liebestraume. They’re in a genre called “Lieder”, which is basically German for “songs”. But a German Lied was a specific type of song genre – putting poems to music. Oftentimes this would be in a piano/singer format, but sometimes it was purely instrumental. So now let’s talk about the background of the Liebestraume. The word is German for “Dreams of Love”, and it’s a collection of 3 solo piano pieces, S. 541. These three pieces were “Lieder”, which is basically just German for “song”, but in the Romantic era, Lieder related to a specific genre of music based on poems. So each one of the three Liebestraume is based on a poem – the first two by Ludwig Uhland, and the last one by Ferdinand Freilgrath. Liszt referred to each of these pieces as “Notturnos”, or “Nocturnes”. This was directly influenced by Chopin, whom Liszt was friends with and greatly admired. When Chopin died in 1849, it was a big blow to Liszt, and he spent time writing music in Chopin-esque genres, such as Etudes, Ballades, and Notturnos, as tribute. So the Liebestraume, or “Dreams of Love”, are all connected in theme – they’re all expressing some aspect of love, and the poem for each reflects that. Doch bin ich vor euch allen reich. Hat sich der Himmel aufgetan. Far richer still am I than all. The heavens above have parted. This first poem, Hohe Liebe, is all about casting away earthly pleasures for a greater spiritual love. This is reflective of Liszt being a very religious person, especially in his later years. I assume this is why he placed it first of the three – because to him, spiritual love was above physical and romantic love. There are a few things this first Liebestraum has in common with the third. First is the key signatures – four flats means they’re both in the key of Ab. There are also long held notes that are surrounded by arpeggios and flowy notes. 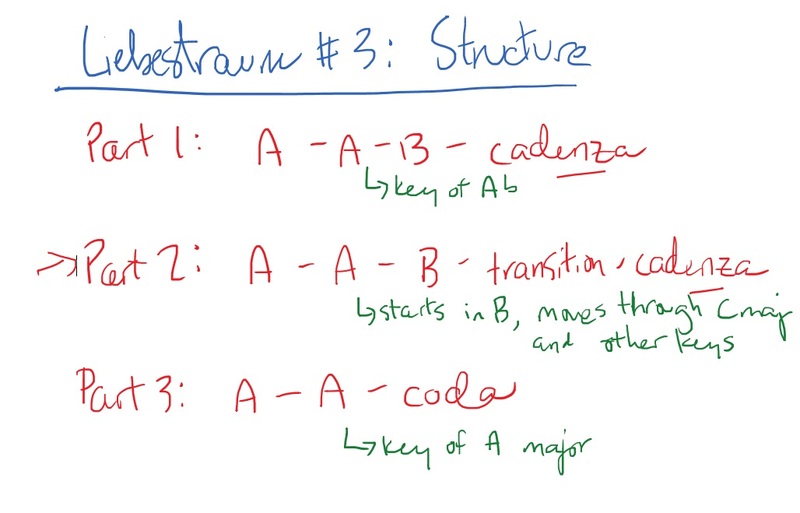 Again, we’ll talk about that in a moment in the third one, but these similarities help link the 3 Liebestraume. The feel of the first Liebestraum is the gentlest and mellowest of the bunch. It’s very pristine and delicate, and doesn’t swell with too much passion. It’s a pretty common thing to relate love to death. There are so many modern-ish songs that equate the two: “I just died in your arms tonight” is just one that pops in my head right away. 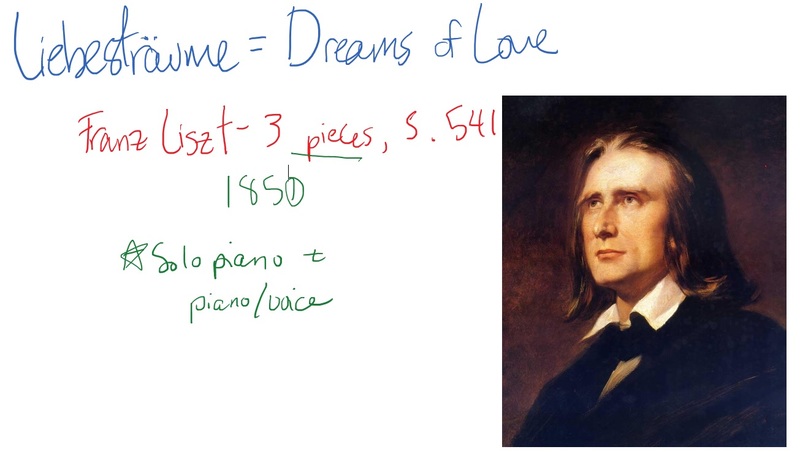 This is what Liszt is doing in his second song of love. This poem/song deals with the physicality of love, and how even though physicality is considered the “lowest” form of love, it can be a doorway to the “highest” form – heaven, death, and the infinite. Oftentimes when composers connect songs in a group, they’ll be connected by related key signatures. Liszt didn’t do that. 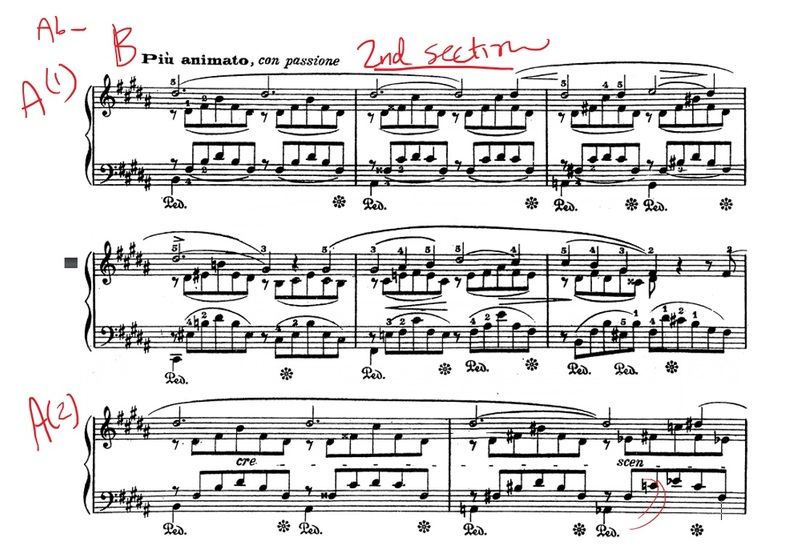 The first and last songs are in Ab major, but this second one is in the key of E. The distance from Ab to E is an augmented 5th, and has a really tense, discordant sound. It must’ve been intentional on Liszt’s part – it makes me think that he wanted to convey the extreme, incompatible polarity of physical love and spiritual love. And despite the incompatibility, it still somehow all works out. He makes it sound very fresh and natural. The third Liebestraum is the one we’ll be focusing on today, titled “Oh love as long as you can”. This Liebestraum is the saddest and most passionate of the bunch, because it’s discussing love that extends beyond death. The bulk of a song is this dream of love – of being reunited with a lost love in dreams – only to be brought back to reality, where that love exists no longer. I love this song’s passionate reminder to live, and love, while you can. It’s this message that life is fleeting and impermanent, but love is forever. I find it really invigorating and inspiring, while also quite melancholic. If you don’t feel anything from this piece, you’re probably a robot. Just sayin’. Analysis time! Firstly, I want to bring your attention to the key signature – four flats, and the first bar outlines an Ab major chord – so this song is in Ab major, just like the first Liebestraum. Well, it serves as a link to the first song, as well as a dramatic contrast to the second one. 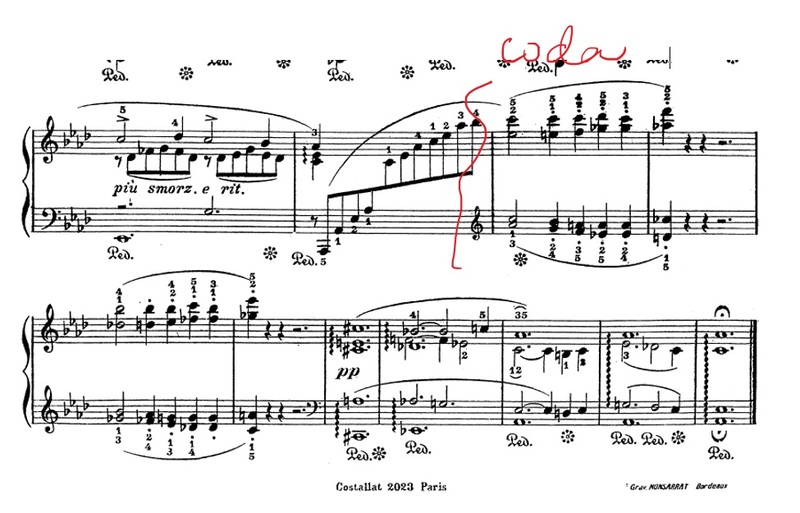 You’ll also notice as we move through the piece that Liszt hops through several key signatures – he doesn’t exist solely in the confines of one key (like many great composers). Next, I want to you notice what looks like a mess of notes. Where is the tune, the melody? You’ll notice all these long notes with stems that move in the opposite direction from the flowy, arpeggiated notes – this is your melody, buried within all this extra stuff. Whether you’re listening or performing, this very simple melody must ring out loud and clear. It is extremely simple, and very pretty. This tune will occur 5 more times in the song (6 total), so we can refer to it as a refrain – a recurring part. Now let’s take a listen to the A section, which is 6 bars long (and is repeated by a second A section – it’s very similar but the melody has more motion). Listen for that simple melody buried in the middle of all the filler notes. So let’s look at the structure for the entire song. There are two cadenzas, which are kind of like musical fills, that divide the three different sections. 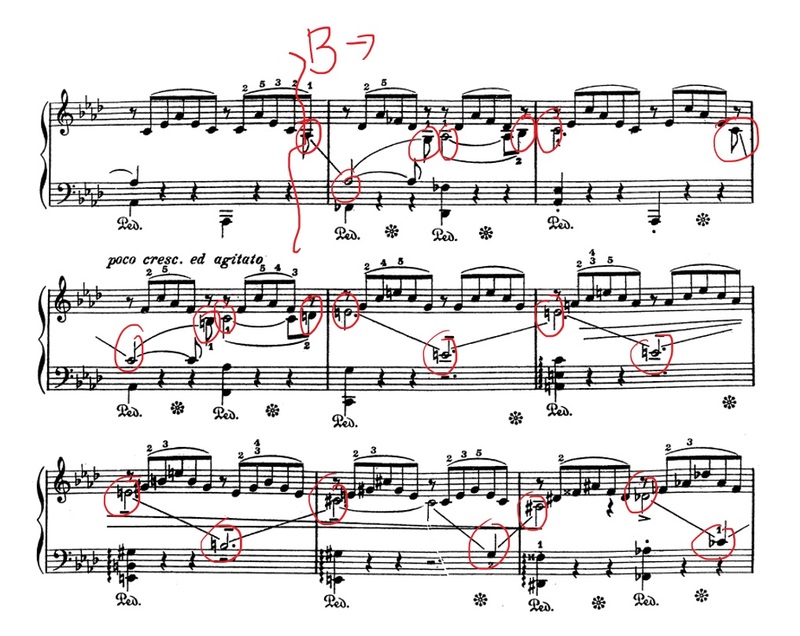 So you can see the pattern there – a couple A sections, followed by a B, which is followed by a cadenza (except for the last section, which ends with a coda). 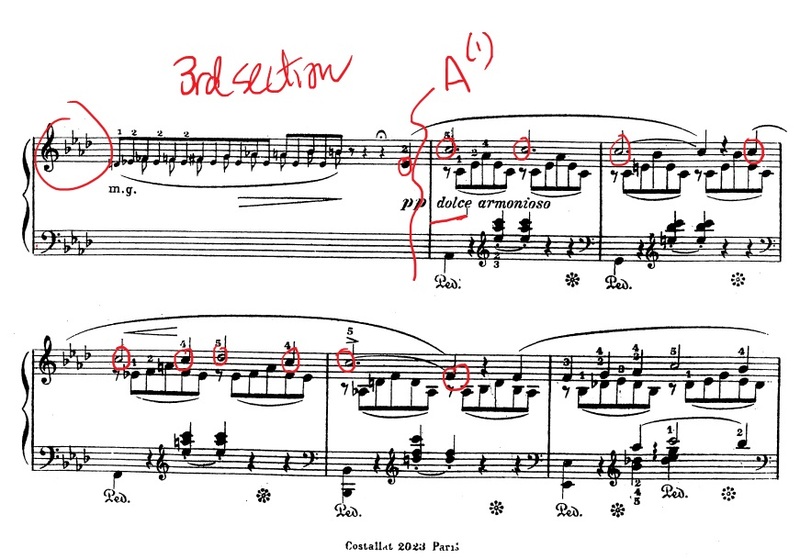 So we’ve already listened and looked at the first A section – now let’s take a look at the B section. I’m going to do the same thing I did earlier, and play a little of the isolated melody. Now take a look at the notes. 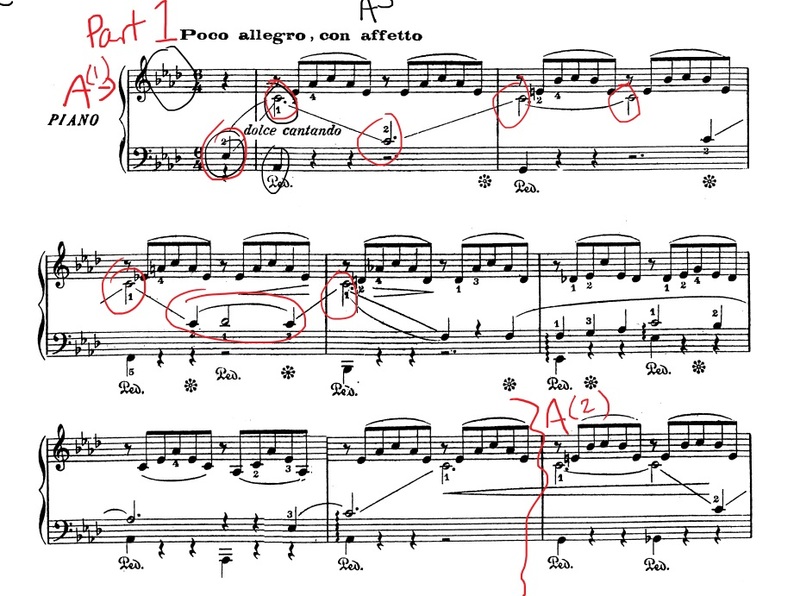 I’ve circled the melody notes – it really does look confusing until you can unearth the tune buried in there like treasure. 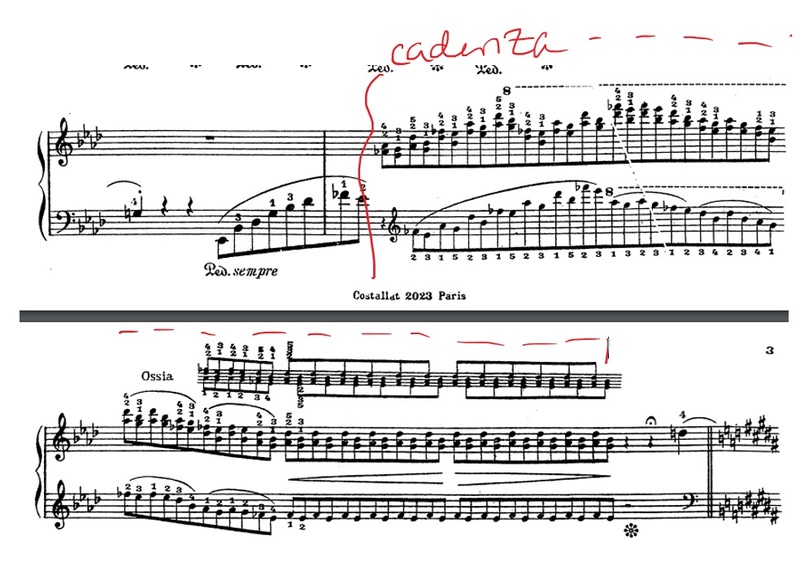 You’ll notice this part has more movement and more accidentals (sharps and naturals), which indicates it’s going to sound more tense (especially when you read “poco cresc. ed agitato”). You’ll notice the clarity of the simple A section is replaced by this dream-like B sequence. Let’s take a listen to the full version. And that brings us to our first cadenza. This one moves up and then back down, which is supposed to represent entering a dream – a dream of love – where the listener/performer can be reunited with their lost love. After the dreamy cadenza, we hit the A theme again – this time, in the key of B. 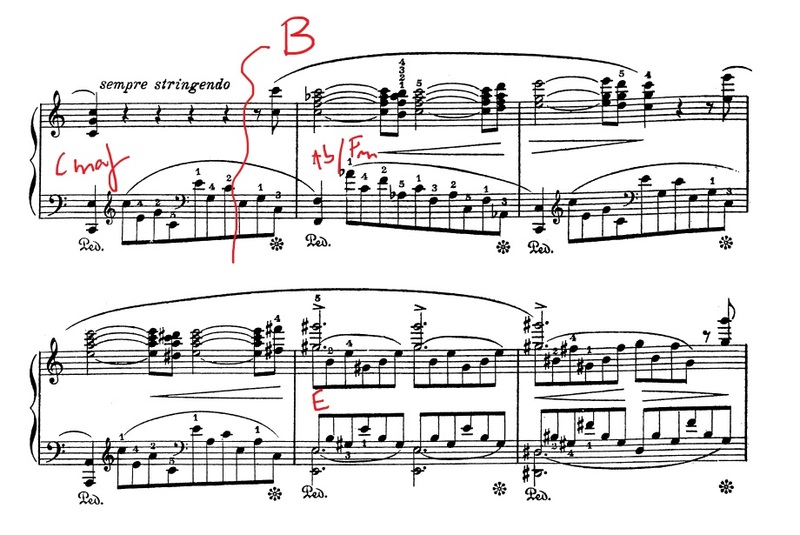 B is an interesting choice, because it’s not a natural key change choice for the key of Ab. Again, I think this clashing is intentional, and representative of love and death. We’ll take a listen to the second A section in the second part – it’s much more agitated and it modulates from the key of B to the key of C, another unnatural movement, which gives the listener this feeling of being about to burst. See if you can hear that same tune as from the beginning. Now we’ve hit the climactic moment of the song, the second B section. This section changes keys constantly – from C major to Ab major to E major and back to Ab – and it really just sounds like turmoil. There’s a lot of pain in this part, but also hope, and – as the song title suggests – plenty of love. After a climactic transition, we come back to earth with the second cadenza, which takes us right from the top of the keyboard all the way back down. The dream is done, we’re back to reality. 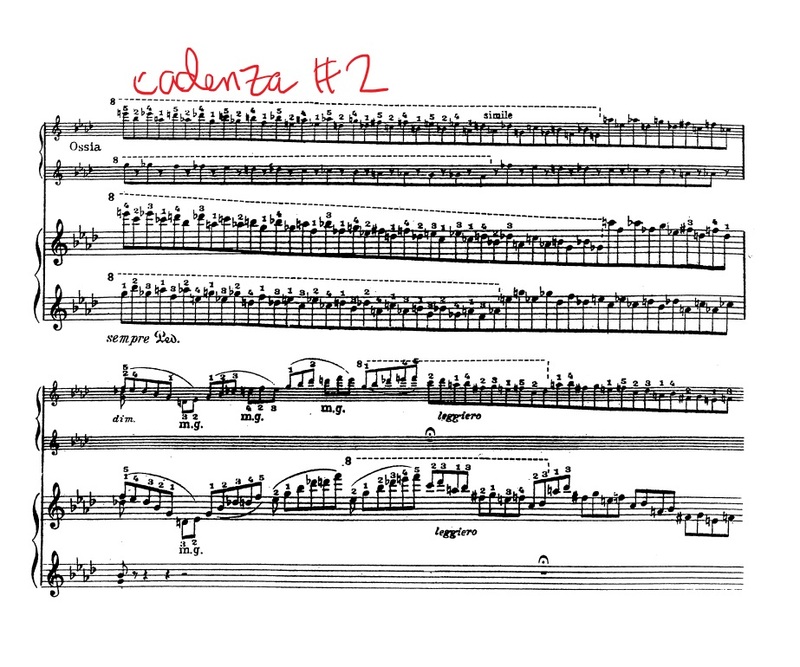 This cadenza is all that intense energy dissipating, like rain clouds in the sunlight. And then we reach the final part of the song, the resolution. We’re back in the key of Ab major, and the tune from the beginning is heard once more. This part of the song is very sweet (dolce) but also very melancholic – it feels different from the peace you feel at the beginning of the song. After the big climactic moment, this resolution isn’t just peaceful – it almost reminds me of sighing. Like when you’ve had this great dream, you sigh, and then carry on with your day. But ultimately, despite the sorrow embedded in this piece, it is a song about the ability of love to transcend even death, so the coda (ending) has a sleepy, yet overall positive feel. It leaves you with a smile, not a frown. It’s such a perfect, spacious ending to an emotional rollercoaster of a song. And that concludes our discussion on the Libestraume by Liszt. I hope you enjoyed this video as much as I enjoyed making it! Here’s a video one of my favorite performances of the Liebestraum #3, if you want to hear the whole thing (you really should!). Piano Solo. Composed by Franz Liszt (1811-1886). Edited by Ernst-Gunter Heinemann. Piano (Harpsichord), 2-hands. Henle Music Folios. Pages: III and 19. Classical. Softcover. 24 pages. G. Henle #HN634. Published by G. Henle (HL.51480634).